SINGAPORE - Tucked away in the corner of a Woodlands neighbourhood, a familiar Christmas scene stands in stark contrast to the Housing Board blocks around it: a log cabin seemingly blanketed in snow. The 4.5m-tall structure in front of Block 178 Woodlands Street 13 is the latest creation of Mr Tan Koon Tat, a long-time resident who has been putting up festive decorations in the neighbourhood for over 10 years, including for Deepavali, Hari Raya Aidilfitri and Chinese New Year. The 58-year-old carpenter by trade, aided by two of his workers, built the log cabin using materials sourced from lumber yards. "In order to finish the set-up before Christmas, we continued working even when it was raining. If it hadn't been raining so much, the work might have been completed sooner," Mr Tan said in Mandarin. The "snow-capped" cabin, with a chimney, is the centrepiece of the set-up complete with a giant sleigh, several candy canes and lighted Christmas trees. Mr Tan said two more reindeer and a Santarina figure would be added just before Christmas. Mr Tan, who used fibre fillings - the material used in the cushioning for sofas - to create the illusion of snow, said he drew inspiration from his family for the project. "Around the end of November I told my son that I was going to do a Christmas theme and I asked him for a picture. Two days later he sent a picture of a log cabin to me. He asked me, 'why don't you build this?' I said, 'OK, I'll ask the RC (Residents' Committee)'." Mr Tan's quest to spruce up his neighbourhood started more than a decade ago, when he first put up lights and streamers along the common corridor to usher in the Chinese New Year. Over time, the decorations became more elaborate. "I would ask if the residents liked it, and if they could accept the various decorations that I had put up. Slowly, I began to understand what was acceptable to them and I added more things every year. Sometimes when I'm working on the structures, residents would walk past and suggest new things to be added. I try my best to comply." Some residents recall fondly his efforts in previous years. "Last year, he had personally bought a snow machine to give us the feeling of having snow. 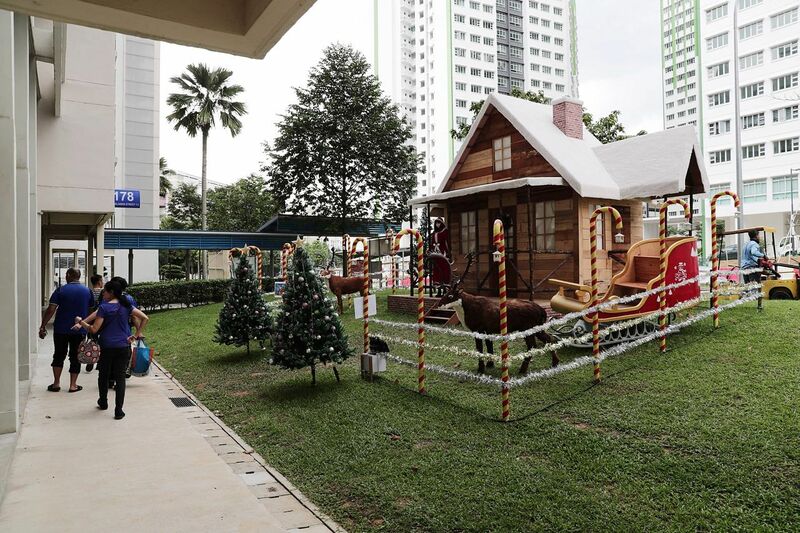 All my seven kids loved it," said Mr Michael See, 42, who lives nearby in a block in Marsiling Road and took his family to see the decorations in 2017 after reading about them in the newspapers. "Adults were enjoying the snow machine too," Mr See's wife Karen, 42, said with a laugh. The See family has come by to view Mr Tan's latest masterpiece. Ms Tan Wen Xi, another resident who lives nearby, said: "This can only be found in our Woodlands neighbourhood. It's so rare. Don't you think it's rare? We don't even have to go to Orchard Road to see the Christmas decorations. We have them here." Mr Tan said people stopped by while he was working on the structure, and some praised him or thanked him for his work. When asked if he was tired of doing this year after year, he replied: "You'll be tired for sure. But when you see so many others enjoying the decorations, you don't feel that tired anymore." He added that the people were his biggest motivation. He declined to reveal the cost of putting up the log cabin. "I don't really want to bring money into this. This was built to bring joy to everyone. You can't put a price tag on that," said Mr Tan with a smile. Earlier this month, Mr Philip Sobrielo Gene, 38, put up a mannequin on the ledge outside his mother's second-storey HDB flat in Clementi as part of Christmas decorations and was told by Jurong-Clementi Town Council to remove them due to safety concerns. He was later given permission to keep the decorations until the end of the year.